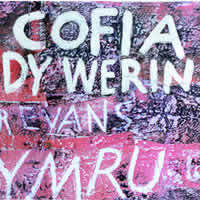 Cofia Dy Werin is a CD featuring a wide range of Welsh folk music, including old favourites and new works written in the style of the established Welsh folk dancing music traditions. The album includes a number of compositions by Rhiain Bebb, one of Wales’ foremost folk dance musicians. The CD is ideal for dancing as well as listening, and features some of the best folk dance players in the Welsh tradition.